Your online source for safety information, tool information and a marketplace for various hand & power tools, pneumatic tools and other tool related items at discount prices. Grab one of these for your toolbox, notebook, or hang one on your garage wall near your drill press. Decimal Equivalents of Drill Sizes Chart. This chart will convert a number, letter or fraction size drill bit to a decimal size. When you need a printable Decimal Equivalents of Drill Sizes chart there it is. Small Drill Sizes Conversion Chart. This printable chart converts smaller sized drill bits(number 60-80 sizes) from number to decimal to mm. Torque Conversion Chart - English to Metric. This printable chart converts foot pounds of torque to newton meters. Torque Conversion Chart - Metric to English. This printable chart converts newton meters to foot pounds of torque (similar to above chart). This handy printable chart tells you what size hole to drill for different tap sizes. This printable chart converts foot pounds of torque to meter-kilograms. This printable chart converts newton meters to inch pounds torque. ** Need a different chart? email me and I'll see if I can post one up for you. How do you control the wood dust from your table saw? 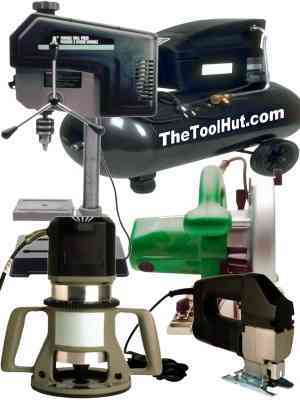 I've decided to sell on this site only the tools that people seemed to be most interested in purchasing in the past. If you've been to this site before you'll notice that it no longer lists over 1000 items for sale. You'll still be able to buy items from here like drills, drill bits, knives, router, router bits, biscuit joiner, saw, grinder, roto hammer, sockets, screwdrivers, hammers, micrometer, welding supplies and air tools. It may take me a while to get everything listed, so please check back often to see whats been added. If you're looking for a hand tool or power tool and can't find it here just email me and I'll see if I can get it for you, I still have access to a huge warehouse full of tools. You can find my email address on the "Contact Me" page. Pay with money order or cashiers check through the mail. Items are shipped only to the lower 48 states U.S. Check out these cool T-shirts, mugs, custom license plates and more. Items are usually shipped within 48 hours after payment is received (excluding weekends and holidays). The items sold from this website will be shipped to you by me from Washington State if they are in stock. The items I don't have in stock will be shipped to you directly from the import warehouse in California. Most of the tools will be shipped via UPS ground, some of the smaller items such as knives may be shipped by United States Postal Service. Feel free to begin browsing the site. Whether you're looking for information, printable conversion charts, want to buy some tools, or even test your knowledge of tools in our "What is This?" page, you can find your way around the site using the links scattered throughout the page including the menu near the top of the web page.